A Hillary Clinton win should help reverse the fortunes of Allergan and Horizon Pharma. Here's why. With the major market indices dropping in sync leading up to the U.S. presidential election, I think it's safe to say the market isn't pleased with the uncertainty Tuesday's vote is stirring up. The flip side of the coin, though, is that this cliff dive has arguably created some outstanding long-term bargains. That said, I'm of the mind that the market will drop even further if Donald Trump pulls off the upset come Tuesday, whereas a sharp rebound may be in store if Hillary Clinton makes history by becoming the first female president. Far from being a political statement, my view is simply that Clinton is the more predictable candidate in terms of policy -- a trait the market has historically favored. Image source: Flickr via user Keith Kissel. Which stocks are the best bargains if Clinton wins? I think investors have to consider the beaten-down specialty pharmas Allergan (NYSE:AGN) and Horizon Pharma plc (NASDAQ:HZNP). The short version of the story is that Allergan and Horizon have tumbled this year, in part, because of their rather loose affiliation with specialty pharma Valeant Pharmaceuticals International (NYSE:BHC). Why have Allergan and Horizon been punished for Valeant's actions? Well, the truth is that these two companies aren't exactly free of some of the same sins. Allergan, for its part, has been extremely aggressive on the M&A front, causing it to take on a boatload of debt -- $32.8 billion at last count. And Horizon, unfortunately, was practicing some of very same mail-order shenanigans to circumvent payer push-back that got Valeant into trouble in the first place. Unlike Valeant, though, the worst seems to be over for Allergan and Horizon. 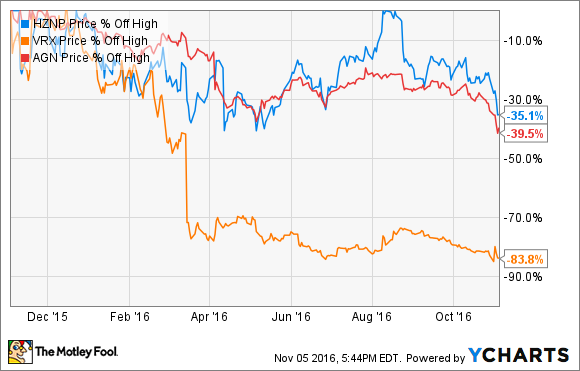 I think Allergan and Horizon are deeply undervalued and are nearing an inflection point for a number of reasons. First off, Allergan has steadily made strides toward becoming a leading growth pharma. This intentional pivot was sparked by Allergan's recent deal to sell its generic-drug unit to Teva Pharmaceutical Industries (NYSE: TEVA) for a handsome $40 billion this year. Turning to the details, this divestiture of its generic unit to Teva has allowed Allergan to pursue additional value-creating acquisitions in the largely untapped non-alcoholic steatohepatitis drug space, initiate a quarterly dividend payout of of $0.70 per share starting in Q1 of 2017, and boost its accelerated share repurchase program by a whopping $10 billion. Topping it off, Allergan's branded pharma business has been boasting double-digit growth lately, fueled by newer products such as the double-chin treatment Kybella, along with its bevy of mature revenue generators such as Restasis and Botox. The big picture is that Allergan is now trading at 4.5 times its 12-month trailing revenue, which is a rock-bottom valuation for a top pharma stock that sports a rich shareholder rewards program and a diverse revenue stream. Horizon, on the other hand, apparently saw the gathering storm clouds around the specialty pharma sub-sector and decided to head toward the safe haven of orphan drugs. As a brief recap, Horizon drew some unwanted attention for the jaw-dropping pricing structure for its pain reliever Duexis. Since then, the company has placed a heavy emphasis on bolstering its orphan drug portfolio, evinced by its acquisition of Raptor Pharmaceutical Corp. that brought into the fold new orphan drugs such as Procysbi, the treatment for nephropathic cystinosis, a rare metabolic disorder, and the cystic fibrosis medication Quinsair. This migration to the orphan-drug market is critical, because drugs for rare diseases tend to come with sizable profit margins, little push-back from payers, and extended periods of exclusivity. Cutting to the chase, Horizon's arguably unwarranted plummet this year has the company's stock trading at a highly compressed forward price-to-earnings ratio of 6.5, even after its share price received a positive bump from third-quarter earnings on Monday morning. While Valeant's valuation is even cheaper, with a forward P/E of a mere 2.5, Horizon comes across as the far better value because of management's decision to broaden its footprint in the less controversial orphan-drug space. Valeant, meanwhile, is a high-risk play that has few options for getting back on its feet. Pharma stocks have reacted poorly to Hillary Clinton's assault on drug prices in the U.S. this year. However, the fact is that this stinging campaign rhetoric probably won't translate into major changes in policy. The pharma industry, after all, has a massive presence in Washington, D.C., that has stymied similar efforts before, and Clinton, in particular, has received some sizable donations from top drugmakers in the past. So my take is that once the headwinds of the political season blow over, stocks such as Allergan and Horizon that have borne the brunt of this criticism will rebound in kind.